Definitions and utility of an herbarium. Definitions and utility of an herbarium. The realization of an herbarium is always of topicality. An herbarium consists of dried plants, then fixed on paper boards without acid, protected by tracing paper and hard-bound shirts. The herbarium term indicates also the places where these dried plants are stored. The most significant herbaria in the world, in a number of exsiccata (dried plants) are that of the national Natural history museum of natural history (8 million samples) then that of the royal Botanical garden of Kew. The herbaria can be private or institutional. Currently, undoubtedly because of budgetary restrictions, of many botanical gardens pose the problem of the utility of an herbarium. Utility of the herbaria There is a few years the constitution of an herbarium was obligatory in many courses school or university and all the botanical gardens had some. Currently, some discuss the need for an herbarium whereas its uses are numerous (Raynal-Castlings, 1994). The herbarium is a died vegetable collection. It presents an objectivity and an unquestionable reality compared to photographs. Thus, a dried plant can be given once again after hydration. The herbarium thus allows the potential validation of identifications carried out on the ground. The herbarium is an image at times given of the vegetation of various sites. It is thus possible to evaluate the evolution of the biodiversity. It makes it possible to establish cartographic inventories of the plants. 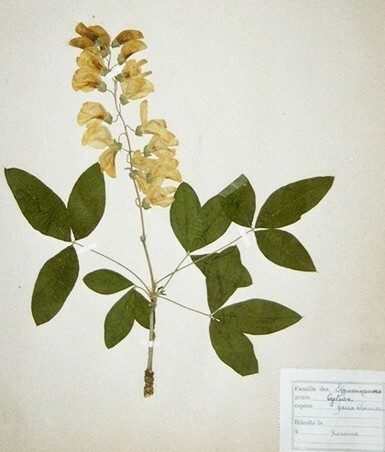 The herbarium allows comparisons between different taxon and of the systematic studies. The boards of herbarium can be lent easily between various institutions of the whole world whereas it would be difficult to exchange material living or to organize forwardings on the ground. Some think, wrongly, that the herbarium can be replaced by images digitized on CD-Rom. Several reasons are opposed to this argument. On the one hand, the investment necessary and its maintenance (multi-media computer, numerical camera, memory) are often out of reach many botanical gardens. In addition, the many keys necessary to the identification of a plant should be replaced per as many photographs: the quantity of memory to be managed would become, in the current of the techniques, extremely difficult, and in all the cases, very expensive state. Moreover, certain floral aspects neglected at a time given thus not memorized can prove, in the future, paramount. In this case, only the possession of the dried plant will make it possible to validate the determination. elit. in Donec Phasellus nec mattis suscipit venenatis commodo et, porta.